BIRMINGHAM, Ala. – Extremely low birth-weight babies are at risk for a chronic lung disease called bronchopulmonary dysplasia, or BPD. 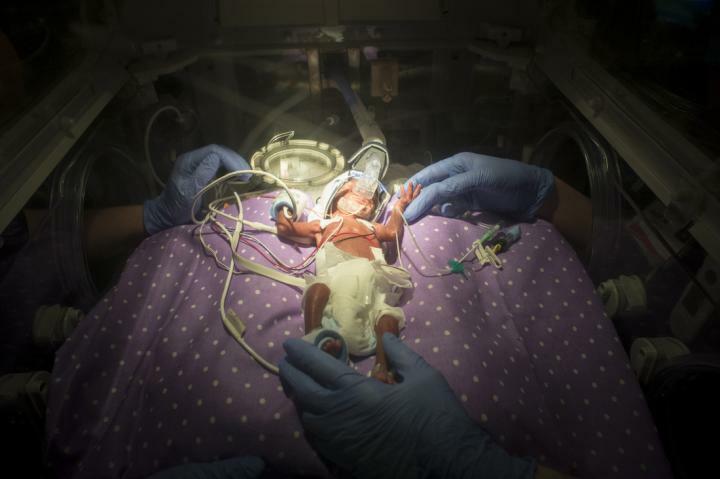 This condition can lead to death or long-term disease, but clinical measurements are unable to predict which of the tiny infants — who get care in hospital intensive-care units and often weigh just one and a half pounds — will develop BPD. University of Alabama at Birmingham researchers now report discovery of a strong predictive biomarker for BPD, and they show a role for the biomarker in the pathogenesis of this neonatal lung disease. These results open the path to possible future therapies to prevent or lessen BPD, which is marked by inflammation and impaired lung development. This biomarker could also help neonatologists plan optimal management and risk stratification of their tiny patients, and it could guide targeted enrollment of high-risk infants into randomized trials of potentially novel treatment strategies. The UAB work, published in the journal JCI Insight, is an example of "bedside to bench" research. It began with prospective studies of extremely premature infants to identify potential biomarkers, and then proceeded to lab experiments using animal models and cells grown in culture to learn how the biomarker functions in disease progression. The study was led by Charitharth Vivek Lal, M.D., assistant professor in the UAB Pediatrics Division of Neonatology, and it builds upon Lal's 2016 report that early microbial imbalance in the airways of extremely premature infants is predictive for development of BPD. The biomarker in the JCI Insight study is microRNA 876-3p. The hunt for the biomarker began with a prospective cohort study at the UAB Regional Neonatal Intensive Care Unit, looking at exosomes obtained from tracheal aspirates of infants with severe BPD, compared with full-term controls. Exosomes are small, membrane-bound blebs or vesicles that are actively secreted by a variety of cells. They are known to contain microRNAs and proteins, and the exosomes act in cell-to-cell signaling. MicroRNAs can regulate gene expression in cells. Lal and colleagues found that airway cells in infants with severe BPD had greater numbers of exosomes, but those exosomes were smaller sized. They also experimentally found that high oxygen exposure for newborn mice or human bronchial epithelial cells grown in culture also caused the release of more exosomes, and the exosomes were smaller in size that those secreted at normal oxygen level. Premature infants often receive extra oxygen to aid their underdeveloped lungs. The UAB researchers then did a prospective discovery cohort study at UAB — they collected tracheal aspirate samples from extremely premature infants within six hours of birth, purified exosomes from the samples and looked for microRNAs in the exosomes. Out of 810 microRNAs that were found, 40 showed differences between infants who later developed BPD and those who were BPD-resistant. Next, in cooperation with researchers at Thomas Jefferson University and Drexel University, a validation cohort was studied in Philadelphia. Thirty-two of the 40 microRNAs were confirmed; six had a higher statistical significance; and one biomarker, a low concentration of microRNA 876-3p, was found to have the highest sensitivity to predict severe BPD in extremely low birth-weight infants. The researchers then showed changes in expression of microRNA 876-3p in BPD in three types of experiments. First, tracheal-aspirate, exosomal microRNA 876-3p expression was decreased in infants with severe BPD, as compared with full-term infant controls. Second, using an animal model of BPD where mouse pups are exposed to high levels of oxygen, microRNA 876-3p expression from exosomes in bronchoalveolar lavage fluid was found to progressively decrease over 10 days of oxygen exposure. At the same time, the gene expression of two targets of microRNA 876-3p increased. Third, exosomal microRNA 876-3p was decreased in supernatants of normal human bronchial epithelial cells exposed to high levels of oxygen for 24 hours, another model for BPD. This was accompanied by higher gene expression of the two targets of the microRNA. Experimental addition of a mimic of microRNA 876-3p, which causes gain of function, increased the expression of microRNA 876-3p and reduced the expression of the two targets. Since Lal and colleagues had previously shown presence of increased Proteobacteria in the airways of infants with severe BPD, they tested the effect of adding Proteobacteria lipopolysaccharide, or LPS, to the animal and cell culture models of BPD. In both models, LPS alone had an effect similar to high levels of oxygen. When LPS and high oxygen were used together in double-injury tests, the researchers found even greater decrease in exosomal microRNA 876-3p; in the animal model, the double injury caused greater impairment of lung development and higher expression of inflammatory cytokines than either high oxygen or LPS alone. Finally, the researchers tested the effect of giving a gain-of-function mimic of microRNA 876-3p to pups in the animal model of BPD. For both the high-oxygen model and the double-injury model of high oxygen and LPS, mice given the mimic showed protection as measured by less alveolar hypoplasia and decreased neutrophilic inflammation. "These data establish that exosomal microRNAs have critical and causative roles in neonatal chronic lung disease pathogenesis," Lal said. Co-authors with Lal on the paper "Exosomal microRNA 876-3p predicts and protects against severe bronchopulmonary dysplasia in extremely premature infants" are Nelida Olave, Colm Travers, Gabriel Rezonzew, Kalsang Dolma, Alexandra Simpson, Brian Halloran and Namasivayam Ambalavanan, UAB Department of Pediatrics; Zubair Aghai, Thomas Jefferson University Department of Pediatrics; Pragnya Das, Nirmal Sharma and Vineet Bhandari, Drexel University Department of Pediatrics; Xin Xu, Kristopher Genschmer, Derek Russell, Tomasz Szul, J. Edwin Blalock and Amit Gaggar, UAB Department of Medicine, Division of Pulmonary, Allergy and Critical Care Medicine; and Nengjun Yi, Department of Biostatistics, UAB School of Public Health. Funding for this research came from American Heart Association grant 17SDG32720009, the Kaul Pediatric Research-Children's of Alabama Foundation, and National Institutes of Health grants HL129907 and HL092906.